Chrishemsworthworkout.net presents an article about a specific topic. 9. The Chris Hemsworth Wor­kout Secrets Ex­po­sed How to Look Like Thor /the-chris-hemsworth-wor­kout-rules-ex­po­sed-how-to.. The web server used by Chrishemsworthworkout.net is run by CyrusOne LLC and is located in Houston, USA. This web server runs 6 other websites, their language is mostly english. 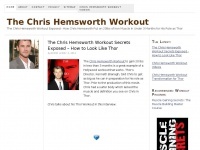 The Chrishemsworthworkout.net websites were developed using the programming language PHP and served by a Nginx server. For managing the data of the webpages the CMS WordPress is used. XHTML 1.0 Strict is used as markup language on the webpages. To analyze the visitors, the websites uses the analysis software Google Analytics. The website prohibits search engines and webcrawlers using the description of the website from the Yahoo directory and using the description of the website from the Open Directory project. Other actions by webcrawlers and bots are allowed.